We’d love your help. Let us know what’s wrong with this preview of Colonial Citizens by Elizabeth Thompson. French rule in Syria and Lebanon coincided with the rise of colonial resistance around the world and with profound social trauma after World War I. In this tightly argued study, Elizabeth Thompson shows how Syrians and Lebanese mobilized, like other colonized peoples, to claim the terms of citizenship enjoyed in the European metropole. The negotiations between the French a French rule in Syria and Lebanon coincided with the rise of colonial resistance around the world and with profound social trauma after World War I. In this tightly argued study, Elizabeth Thompson shows how Syrians and Lebanese mobilized, like other colonized peoples, to claim the terms of citizenship enjoyed in the European metropole. The negotiations between the French and citizens of the Mandate set the terms of politics for decades after Syria and Lebanon achieved independence in 1946. - First, a colonial welfare state emerged by World War II that recognized social rights of citizens to health, education, and labor protection. - Second, tacit gender pacts were forged first by the French and then reaffirmed by the nationalist rulers of the independent states. These gender pacts represented a compromise among male political rivals, who agreed to exclude and marginalize female citizens in public life. To ask other readers questions about Colonial Citizens, please sign up. Thompson develops her argument by a historical recount of Syria and Lebanon with special emphasis between the years of the First and Second World War. Thompson believes these interwar years are more critical than other historians have formally given them credit for, and she believes that it was during these years that the “common political legacy,” of perpetuating, “Islamic laws that accentuate inequality between men’s and women’s personal status”2 was created. It is Thompson’s hope that through her research, she would “redress [the inherent] weakness in previous studies”3 by fully delving into the psyche of the marginalized in this area and explore the particular reforms created during the interwar period while France acted as a paternalistic ruler to guide these people to an eventual self-government. Thompson proposes that the interwar years were “seminal in laying the foundations of postcolonial states and citizenships,” and that the “experience of war, economic dislocation, and rapid change in urban social life had as profound an effect on politics as the particular strategies of [the] elite political actors”4. Of particular interest to the student would be the various revolts led by the marginalized against their new paternalistic government 5. These revolts inevitably failed, since a common binding agent besides oppression was unable to fuse the marginalized groups together. Such division between the marginalized therefore only “infused the civic order with a new style of political bargaining,”6 between the subalterns and helped perpetuate the growing inequalities of the system. Within the realm of Thompson’s work, the research methods used to create her argument are flawless. Utilizing foreign ministry records left by the French during their occupation, French and Arabic periodicals, military, legal and missionary archives from this period, as well as interviews with various indigents of the area she encapsulates the essence of this people into an innovative historical accounting. Overall, Thompson made a compelling argument for the necessary revision to historical approaches in the subject of Arabic and Islamic culture. This Leacockian7 approach to history was useful to those within the study of Middle Eastern and specifically Syrian and Lebanon studies, and colonial imperialism in general. Unfortunately I found Thompson’s approach a little lacking. A comparison between Syria and Lebanon to other countries in the Middle East which did not undergo a period of republicanism, or other countries which were able to break free of their ties to paternalism and create more lasting personal status reforms, would have proved both interesting and provided a greater understanding to the reader. Furthermore, a more elaborate account of elite nationalist movements would have added substantially to the historical account of this era. Additionally, I feel that the relative socialist undertones throughout the presentation of this historical account are rather short sighted although they do provide a thoughtful framework for the author’s argument. As it stands, Colonial Citizens is more than a historical recount of the role French imperialism in the Levant. It is a call to fellow historians to delve deeper into the interim periods of history, to delve deeper into the intricate lives of the citizens there and seek a greater understanding of such moments upon history. Rather than seeking to supplant previous historical works regarding the Levant, Thompson hopes to further accentuate the historical intricacy of how “states and their citizens are constructed under colonialism and then bequeathed to their postcolonial successors,” not as a “unilateral system of rule,” but as a, “constant negotiation of power relationships and identities.”8 Thompson’s work as a tool to reconceptualize the essence of colonial rule through understanding the role of paternalism upon gender and the struggle for a solid civic order is a deft masterpiece. The pace of the book progresses slowly due to the intricate nature of her argument, but as a whole I believe it to be a superior work of literature for this genre. 1. 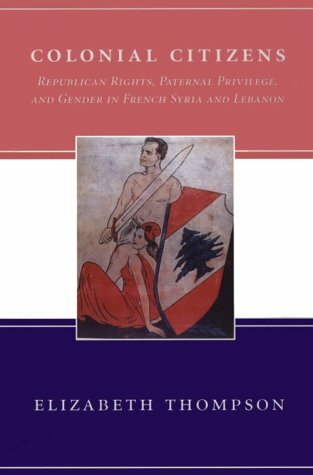 Elizabeth Thompson, Colonial Citizens: Republican Rights, Paternal Privilege, and Gender in French Syria and Lebanon (New York: Columbia University Press, 2000), 287. 2. Thompson, Colonial Citizens, 9. 3. Thompson, Colonial Citizens, 12. 4. Thompson, Colonial Citizens, 3. 5. Thompson, Colonial Citizens, 110. 6. Thompson, Colonial Citizens, 111. 7. This is pertaining to the work of anthropologist Eleanor Burke Leacock, who held that the subordination of women was a product of history and not a universal condition – a theory which she felt was over looked by male predecessors who failed to create accurate ethnographic accounts due to their personal biases as capitalist or imperial citizens. Furthermore it should be noted that Thompson and Leacock both attended Columbia University – an important factor when considering schools and the continuation of feminist ideology, especially since Thompson received her MIA only two years after Leacock’s death. 8. Thompson, Colonial Citizens, 1. This book breaks down the division between the categories of “colonizer” and “colonized” in the French Mandates of Syria and Lebanon. In its place, Thompson emphasizes the fluidity of the relationship between all numbers of colonial and colonized classes, sects, genders and subalterns in the vortex of what she terms the "civic order" – the discursive “space” in which various factions of the colonized and the colonizer renegotiated their positions, rights, and responsibilities. Colonization was n This book breaks down the division between the categories of “colonizer” and “colonized” in the French Mandates of Syria and Lebanon. In its place, Thompson emphasizes the fluidity of the relationship between all numbers of colonial and colonized classes, sects, genders and subalterns in the vortex of what she terms the "civic order" – the discursive “space” in which various factions of the colonized and the colonizer renegotiated their positions, rights, and responsibilities. Colonization was not a ‘one-way’ street, but rather a dialogue, or even a jockeying for position. Thompson feels that three conditions made Syria/Lebanon ripe for this kind of development: the ravages of the Great War, the post-war inception of inchoate independent states under European Mandate tutelage, and the imposition of European colonial rule. For Thompson, gender is the supreme variable in this study, both as an analytical tool, and as an object of study. The meaning of the former is obvious, but as a subject of study Thompson sees gender as having been a ‘battleground’ in the context of the Mandate system in Syria/Lebanon. Not only was it the arena in which the colonizer/colonized locked heads, but (as Fleischmann also observes) the colonizer colluded with and manipulated patriarchal forces among the colonized in order to maintain its own power. One of the key tensions running through this analysis is the contradiction between the French revolutionary ideals of republican fraternity and French colonial and Arab elite notions of gender paternalism. The book is nothing if not thorough, and indeed seems a little interminable. Sections 4 and 5 of the book drag it out a bit too much. One thing Thompson is wont to do is psychologize her subjects, which some may have a problem with. She seems to offer somewhat believable insights into the state of 'male psyche' at particular junctures in Syrian and Lebanese history, but these are ultimately subjective and perhaps even shaky theories. Nevertheless, they are plausible, and at the end of the day, I suppose all scholarship is really 'best guess'. That's all it is. This one was loaned to me by a friend who studies women's history. It did not disappoint. Although I have done a bit of reading on colonialism, it's mostly been British and also not really 20th century mandates and things. And I do very little work on gender or paternalism or anything like that. But, I am very interested in the interwar years, and in the context of what's currently happening in Syria. So yeah, it took me some time, but I read it. Though I probably should have prepped with some g This one was loaned to me by a friend who studies women's history. It did not disappoint. Although I have done a bit of reading on colonialism, it's mostly been British and also not really 20th century mandates and things. And I do very little work on gender or paternalism or anything like that. But, I am very interested in the interwar years, and in the context of what's currently happening in Syria. So yeah, it took me some time, but I read it. Though I probably should have prepped with some general French mandate history, haha. Brilliant work. I am considering this as a good model for my dissertation now. written by my advisor at uva. it hurts to say it but the book is really awesome.